The immune system recognizes viruses when antigens on the surfaces of virus particles bind to immune receptors that are specific for these antigens. This is similar to a lock recognizing a key. After an infection, the body produces many more of these virus-specific receptors, which prevent re-infection by this particular strain of the virus and produce acquired immunity. Similarly, a vaccine against a virus works by teaching the immune system to recognize the antigens exhibited by this virus. However, viral genomes are constantly mutating, producing new forms of these antigens. If one of these new forms of an antigen is sufficiently different from the old antigen, it will no longer bind to the receptors and viruses with these new antigens can evade immunity to the original strain of the virus. When such a changes occurs, people who have had the illness in the past will lose their immunity to the new strain and vaccines against the original virus will also become less effective. Two processes drive the antigens to change: antigenic drift and antigenic shift, antigenic drift being the more common (see figure 1). In the influenza virus, the two relevant antigens are the surface proteins, hemagglutinin and neuraminidase. The hemagglutinin is responsible for entry into host epithelial cells while the neuraminidase is involved in the process of new virions budding out of host cells. The host immune response to viral infection is largely determined by the immune system's recognition of these influenza antigens. Vaccine mismatch is a potentially serious problem. Antigenic Drift is the continuous process of genetic and antigenic change among flu strains. Figure 1. 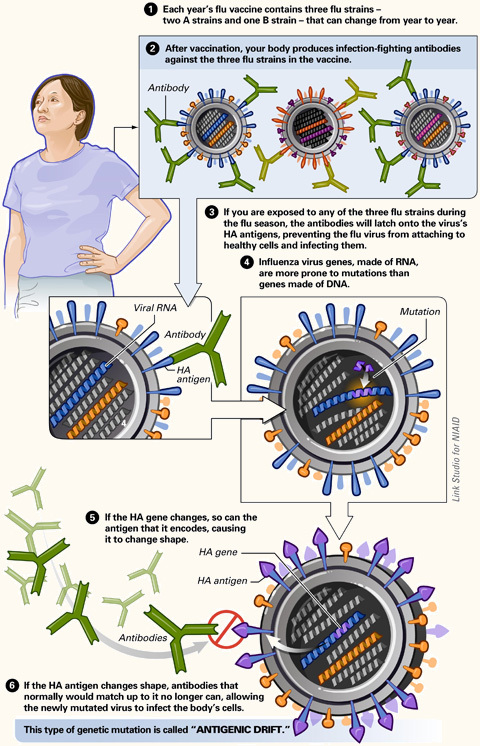 Illustration of potential influenza antigenic drift. To meet the challenge of antigenic drift, vaccines that confer broad protection against heterovariant strains are needed against seasonal, epidemic and pandemic influenza. As in all RNA viruses, mutations in influenza occur frequently because the virus' RNA polymerase has no proofreading mechanism, providing a strong source of mutations. Mutations in the surface proteins allow the virus to elude some host immunity, and the numbers and locations of these mutations that confer the greatest amount of immune escape has been an important topic of study for over a decade. Antigenic drift has been responsible for heavier-than-normal flu seasons in the past, like the outbreak of influenza H3N2 variant A/Fujian/411/2002 in the 2003 - 2004 flu season. All influenza viruses experience some form of antigenic drift, but it is most pronounced in the influenza A virus. Antigenic drift should not be confused with antigenic shift, which refers to reassortment of the virus' gene segments. As well, it is different from random genetic drift, which is an important mechanism in population genetics.